This remarkable feature revealed an exceptionally rare, unbroken sequence of deposits dating from at least the later Mesolithic to the early Bronze Age. It was discovered by Martin as a clear circular crop mark nearly 10m in diameter (see image 01), betrayed by the much greater luxuriant growth of the grass at this spot. No previous indication of its existence had been suspected despite intensive fieldwalking and aerial observation, and the fact that it lay within a five-minute walk from Martin’s house. Martin started to excavate this crop mark in 1992, first encountering a layer containing exclusively Beaker period pottery and flintwork. Below this was a sequence of layers containing mid – late Neolithic pottery of the Peterborough tradition followed by layers producing a few sherds of earlier Neolithic plain bowl. The lower layers of the 3m deep weathering cone produced no pottery but bones exclusively of wild animals (aurochs, deer and pig) and flintwork — the only diagnostic pieces of which were all Mesolithic (Green & Allen 1997). This included a group of seven microliths found in fresh condition and in very close association. Five were of ‘rod’ form, a type which is uncommon in the area. Image 01 – This splendid crop mark appeared in 1990 and revealed the site of the Fir Tree Field shaft. Image 02 – The Fir Tree Field Shaft in Google Earth. Image 03 – The Fir Tree Field Shaft – excavated section. It seems quite likely that these were hafted as a composite tool or weapon when they came to rest in the shaft. A radiocarbon date from an aurochs bone at this level indicates a dates of 4340 – 3990 cal BC. This falls within the late Mesolithic -early Neolithic transition, a time when rod microliths commonly occur. However, no conclusive contemporary Mesolithic site has yet been found in the area. The excavations to this stage revealed stratified layers within a very large weathering cone, beneath which lay a deep shaft infilled with almost artefact-free chalk rubble interspersed with dark, organic-rich lenses. The shaft itself was 4 – 5m in diameter with irregular, but essentially vertical, eroded sides. In the summer of 1994, the water table was reached at a depth of 13.2m and excavations were abandoned. Further excavation seemed impossible and fruitless, and augering showed that even at 25.2m (83ft) below the surface the bottom had still not been convincingly reached. The upper 7m of the primary shaft filling consisted of chalk rubble interspersed with ten main dark organic-rich soil lenses which contained no diagnostic artefacts. The skeletons of two young roe deer were uncovered within the chalk rubble that had accumulated from the weathering and eroding sides of the shaft. They had probably fallen in accidentally, died, and their bodies been covered by the gradual natural infilling. Image 04 – The Fir Tree Field Shaft section plan. Two seams of poor nodular flint outcropped in the side of the shaft at 3.5 and 5m. Some loose nodules from these seams had been tested for knapping suitability, but this appears to have been an incidental activity taking place when the shaft was already substantially filled. Below the lowest black soily lens at nearly 10m from the surface, a further 3m of degraded chalk rubble bands, devoid of artefacts, were encountered before a layer of much larger chalk blocks was reached and this is where excavation was abandoned. Augering showed the soft waterlogged chalk continuing for another 12m. 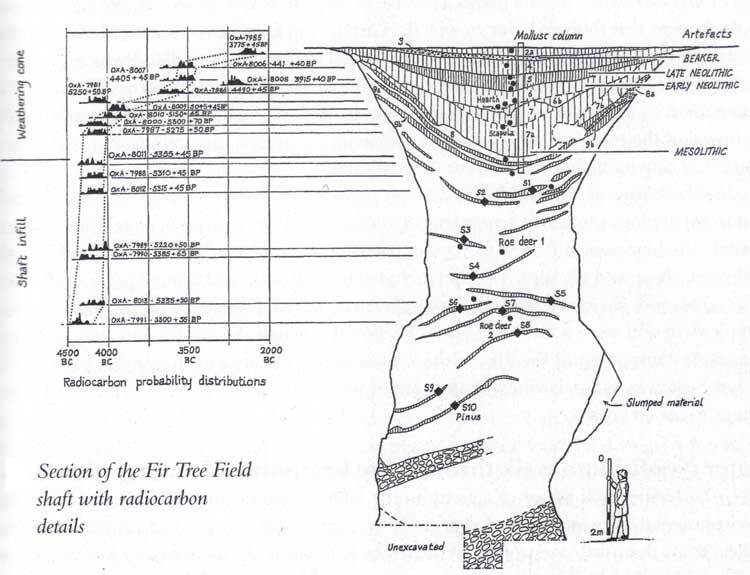 A series of 17 radiocarbon dates from the upper 7m of the fill of the shaft and the weathering cone provides the date and rate of accumulation of the sequence (Allen & Green 1998). The chalk rubble fills, including the two young roe deer, all centred on the late fifth millennium BC. They prove that over 4m of coarse rubble accumulated very quickly — at the most over a few hundred years. The lower fills of the weathering cone which included the Mesolithic microliths, accumulated at the same rate and over the same period of time (about 4300 – 4150 cal BC). The rate of accumulation given by the radiocarbon dates is very fast and clearly shows the date of the fills of the excavated portion of the feature dates to the late Mesolithic. But how was it formed? A human agency is most unlikely and there is no evidence of either human production of the shaft, nor of any debris discarded during its excavation. We can only conclude that it must a have natural origin. Solution hollows and dolines are widespread on the chalk. In Dorset most originate by water percolating though overlying acid clays and soils, dissolving the chalk and enlarging already weak fissures. Elsewhere in Dorset, even where these clays have been eroded away, substantial residues and clay-rich deposits are found in these features. No trace of any such clay or residue was found within, or close to our shaft. However, the shaft does lie within a few metres of deeper Coombe Deposits, in which lie the naleds. The naleds were created towards the end of the Ice Age and it is possible that the water unleashed by thawing ice may have percolated deep into the chalk and eroded fissures and channels producing ‘cave systems’. Subsequent partial collapse of these systems could account for local subsidence and the creation of features such as the shaft. Although its origin still remains open to speculation, the feature has provided a long, dated and unprecedented environmental sequence spanning not only the Mesolithic/Neolithic transition but also the Neolithic/Bronze Age one as well: a sequence unique for the chalklands of western Europe. So what has this information told us? The dark humic lenses in the shaft (see image 05) were comprised of soil, leaf litter and other organic debris that accumulated on temporary surfaces during the shaft infill. The environment around the shaft during the later Mesolithic (dated here to the early fifth millennium BC) seems to have been a closed but light forest providing ideal cover for deer, but also for the flowering and fruiting of hazel trees. Some red deer bone between the soil layers was butchered, indicating Mesolithic hunting within the open forest. The Fir Tree Shaft during excavation. The Fir Tree Shaft with viewing gantry. The Fir Tree Shaft from above. This is in a period when we should see good woodland of the ‘climatic optimum’, which we have inferred existed in the slightly earlier evidence (mid-sixth millennium BC) washed into the Cursus ditch. The difference seen here indicates a slightly different picture of local vegetation, possibly created by the presence of the ‘great shaft’ itself In a short space of time, although the rate of infill remains constant, a change is revealed in the local landscape. The once open woodland became denser with deciduous trees forming a good leaf litter layer, more typical of our regional and national conception of the later Mesolithic landscape (primeval forest). Perhaps the most significant evidence is of the creation of a progressively larger clearance within the wood which followed and occurred at the same time as the hafted microlith weapon was lost; perhaps hurled into the almost infilled shaft in pursuit of red deer or aurochs, the isolated bones of which were found here. This clearance is radiocarbon dated about 4350-4000 cal BC and is one of the first recorded woodland clearances in southern England. Here it might have been created to attract wild animals to graze and browse on the lighter vegetation, and provide an ideal hunting ground. The depression left by the ‘great shaft’ may have given ritual significance to the area, as well as providing a convenient culling basin. After a time woodland re-colonised the clearing, re-enforcing our indication of the transient nature of Mesolithic activity in the area. Although the environmental evidence from the shaft continues into the Neolithic and Early Bronze Age, it is better to deal with these chronologically with our other evidence.